In the last 12 years, terrorist attacks in Europe have killed 459 civilians. The U.S. killed at least 472 civilians in Syria, just in the last month. Every time a terrorist attack occurs in Europe, it is met with an abundance of media coverage, and each victim is mourned by the public on a grand scale. However, the concern for the loss of innocent life appears to be almost nonexistent when the United States kills more civilians in one month than terrorist attacks in Europe have killed in the last 12 years. 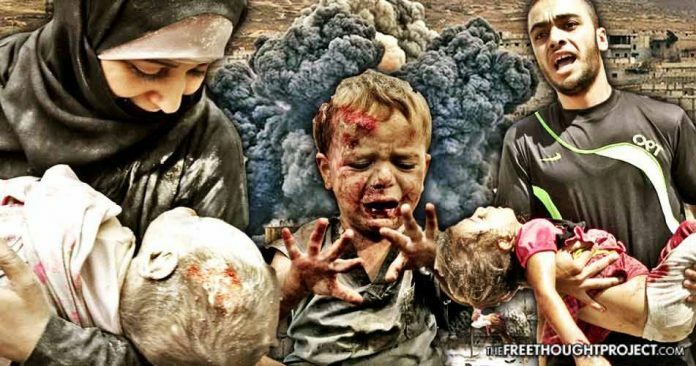 A group monitoring the Syrian conflict reported on Friday that airstrikes launched by the United States-led coalition in Syria have killed 472 civilians from May 23 to June 23. In the last 30 days, the Syrian Observatory for Human Rights reported that the provinces with the largest death tolls were Deir Ezzor with 222 civilian deaths, including 84 children, and Raqqa with 250 civilian deaths, including 53 children. The Observatory also noted that the latest figure is more than double the previous month, which was around 225 civilian deaths. As The Free Thought Project has reported, the U.S.-led coalition entered the city of Raqqa for the first time on June 6, in the name of driving out the Islamic State. However, the first few days of the offensive resulted in reports of the coalition using a cluster of airstrikes including illegal chemicals such as white phosphorus on a city with a population of around 200,000 people. While the U.S. claims its purpose is to defeat ISIS, its actions have been questionable. As Americans celebrated Father’s Day on Sunday, the U.S. shot down a Syrian warplane that was targeting the militants. In response, Russia announced that it is halting cooperation with the U.S. and its allies. Just before the dramatic increase in airstrikes, a terrorist attack killed 22 people in Manchester, England, on May 22. Not surprisingly, the Islamic State was eager to take responsibility for the attack. The Manchester Attack is just one example of a loss of innocent life that has been exploited by western media and used for political gain. The loss of 22 innocent lives in England was used by the U.S. to justify going on to take nearly 500 innocent lives that have been blatantly ignored by the media. Following the Manchester Attack, an attack near London Bridge in June killed eight civilians, bringing the total up to 30 deaths so far in 2017. In 2016, terrorist attacks in Germany, France and Belgium killed 130 civilians. In 2015, terrorist attacks in France and Macedonia killed 155 civilians. In 2011, terrorist attacks in Norway and Belarus killed 92 civilians. In 2005, a terrorist attack in England killed 52 civilians. When looking at the last 12 years in Europe, terrorist attacks have taken the lives of 459 civilians. That is still less than the at least 472 civilians that were killed by the U.S. in Syria, just in the last month. Despite the fact that Americans’ tax dollars are funding the war that has created the sharp increase in civilian deaths, the overwhelming concern that exists among the media and U.S. politicians when it comes to the loss of innocent life in Europe, has been virtually nonexistent when it comes to the loss of innocent life in Syria.